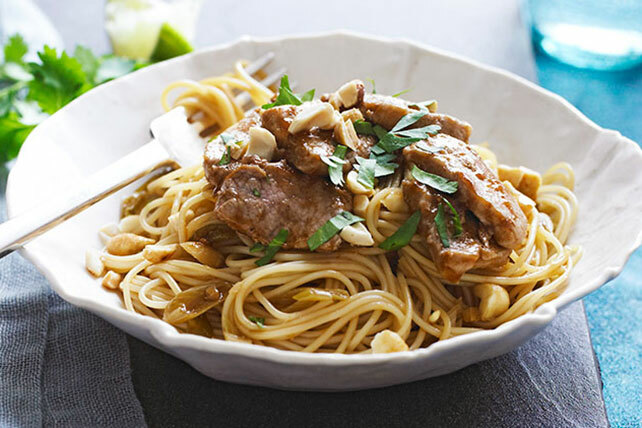 Texas-style BBQ sauce gets doctored up with soy sauce, lime juice and garlic to make this Asian-inspired pork noodle bowl. Mix first 6 ingredients until blended. Heat 2 tsp. oil in large skillet on medium-high heat. Add half the meat; cook 2 min. or until no longer pink, turning after 1 min. Remove from skillet; cover to keep warm. Repeat with remaining meat. Return all meat to skillet. Stir in barbecue sauce; cook and stir 1 min. Remove from skillet; cover to keep warm. Cook pasta as directed on package, omitting salt. Meanwhile, heat remaining oil in large skillet. Add onions, ginger and garlic; cook and stir 30 sec. Stir in broth mixture; bring to boil. Drain pasta. Add to broth mixture in skillet; stir to coat. Spoon into soup bowls; top with meat, nuts and cilantro. Prepare using boneless chicken or beef. For extra kick, serve with hot sauce. Prepare using your favorite BULL'S-EYE Barbecue Sauce, such as Original.